Decollate snails are commonly referred to as Mediterranean snails. 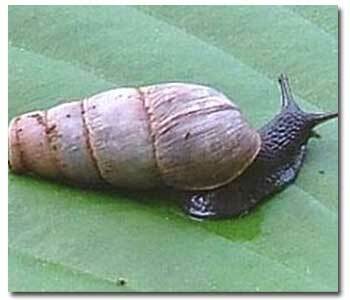 When you hear folks complain about snails turning their garden into a salad bar, they are referring to helix snails. The Helix snails will invade your garden and pick your plants clean. It is heartbreaking to watch it happen. In the past there have been 2 solutions. The most common was a cycle of applying snail bait, watching the population dwindle, and then eventually returning and the homeowner spreading yet another layer of snail bait. The other more time consuming method is the “hunt and crunch” method of hand picking snails from your garden. Like clowns climbing out of a Volkswagen.. they just keep on coming. This is where decollate snails come in. They are a natural hunter of helix snails, and helix snail eggs. The decollate snails will actually clean your garden for you. When you get your first batch it will seem like they are not up to the job. They are small, usually dormant and once in your garden they disappear. They burrow in the day to stay cool and damp, but at night they feast on the bad guys. The decollate population will rise and fall seasonally. They will meet the demand of the Helix snail population. When your garden is clear of helix snails the decollates will dine on decomposing organic material, becoming little compost machines. Surely the helix will return and in time the Decollate population will become robust again. I am not as patient as I should be so I add new decollates each spring to give them a head start. I expect many of my neighbors’ gardens have become homes for decollates. There is comfort in knowing I am not adding chemicals, and I don’t have to get my Snail Crushing Combat Boots on anymore.